For more details on this topic, see Jewish ghettos in German-occupied Poland. 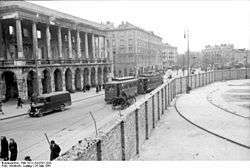 Right to left: Warsaw Ghetto, Ghetto wall, Iron-Gate Square, Lubomirski Palace, 24 May 1941. 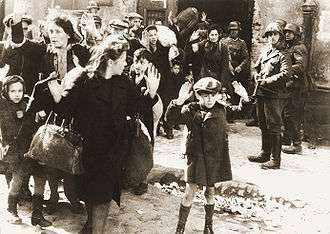 The Warsaw Ghetto (German: Warschauer Ghetto, called by the German authorities Jüdischer Wohnbezirk in Warschau, Jewish residential district in Warsaw; Polish: getto warszawskie) was the largest of all the Jewish ghettos in Nazi-occupied Europe during World War II. It was established in the Muranów neighborhood of the Polish capital between October and November 16, 1940, part of the territory of the General Government of German-occupied Poland, with over 400,000 Jews from the vicinity residing in an area of 3.4 km2 (1.3 sq mi). From there, at least 254,000 Ghetto residents were sent to the Treblinka extermination camp over the course of two months in the summer of 1942. 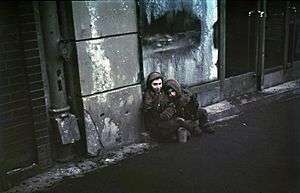 The death toll among the Jewish inhabitants of the Ghetto, between starvation, disease, deportations to extermination camps, Großaktion Warschau, the Warsaw Ghetto Uprising, and the subsequent razing of the ghetto, is estimated to be at least 300,000. 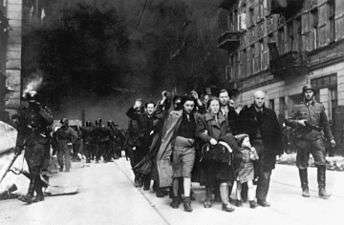 The Germans closed the Warsaw Ghetto to the outside world on November 15, 1940. The wall was typically 3 m (9.8 ft) high and topped with barbed wire. Escapees could be shot on sight. The borders of the ghetto changed many times during the next years. 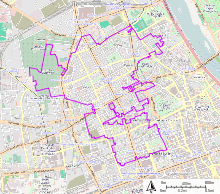 The ghetto was divided by Chłodna Street, which due to its importance (as one of Warsaw's major east-west arteries) was excluded from it. The area south of Chłodna was known as the “Small Ghetto”, while the area north of this street was the “Large Ghetto”. Those two parts were connected by Żelazna Street, and a special gate was built at its intersection with Chłodna Street. In January 1942, the gate was closed and a wooden footbridge was built in its place, which after the war became one of the symbols of the Holocaust. The first commissioner of the Warsaw ghetto was his chief organizer SA-Standartenführer Waldemar Schön. He was succeeded in May 1941 by Heinz Auerswald. Like all the ghettos in Poland, the Germans ascribed the administration to a Judenrat (a council of the Jews), led by an "Ältester" (the eldest). 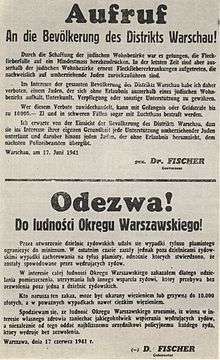 In Warsaw this role was attributed to Adam Czerniaków, who chose a policy of collaboration with the Nazis rather than revolt. Adam Czerniaków confided his harrowing experience in several diaries. He became aware of his own tragic duplicity in July 1942 and committed suicide. 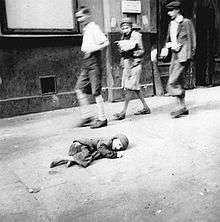 During the next year and a half, thousands of Polish Jews as well as some Romani people from smaller cities and the countryside were brought into the Ghetto, while diseases (especially typhus), and starvation kept the inhabitants at about the same number. Average food rations in 1941 for Jews in Warsaw were limited to 184 calories, compared to 699 calories for gentile Poles and 2,613 calories for Germans. Unemployment was a major problem in the ghetto. Illegal workshops were created to manufacture goods to be sold illegally on the outside and raw goods were smuggled in, often by children. Hundreds of four- to eight-year-old Jewish children went across en masse to the "Aryan side," sometimes several times a day, smuggling food into the ghettos, returning with goods that often weighed more than they did. Smuggling was often the only source of subsistence for Ghetto inhabitants, who would otherwise have died of starvation. Despite the grave hardships, life in the Warsaw Ghetto was rich with educational and cultural activities, conducted by its underground organizations. Hospitals, public soup kitchens, orphanages, refugee centers and recreation facilities were formed, as well as a school system. Some schools were illegal and operated under the guise of a soup kitchen. There were secret libraries, classes for the children and even a symphony orchestra. Rabbi Alexander Zusia Friedman, secretary-general of Agudath Israel of Poland, was one of the Torah leaders in the Warsaw Ghetto. He organized an underground network of religious schools, including "a Yesodei HaTorah school for boys, a Bais Yaakov school for girls, a school for elementary Jewish instruction, and three institutions for advanced Jewish studies". These schools, operating under the guise of kindergartens, medical centers and soup kitchens, were a place of refuge for thousands of children and teens, and hundreds of teachers. In 1941, when the Germans gave official permission to the local Judenrat to open schools, these schools came out of hiding and began receiving financial support from the official Jewish community. Over 100,000 of the Ghetto's residents died due to rampant disease or starvation, as well as random killings, even before the Nazis began massive deportations of the inhabitants from the Ghetto's Umschlagplatz to the Treblinka extermination camp during the Grossaktion Warschau, part of the countrywide Operation Reinhard. Between Tisha B'Av (July 23) and Yom Kippur (September 21) of 1942, about 254,000 Ghetto residents (or at least 300,000 by different accounts) were sent to Treblinka and murdered there. Friedman alerted world Jewry to the start of deportations from the Warsaw Ghetto in a coded message. His telegram read: "Mr. Amos kept his promise from the fifth-third." He was referring to the Book of Amos, chapter 5, verse 3, which reads: "The city that goes out a thousand strong will have a hundred left, and the one that goes out a hundred strong will have ten left to the House of Israel". Polish resistance officer Jan Karski reported to the Western governments in 1942 on the situation in the Ghetto and on the extermination camps. By the end of 1942, it was clear that the deportations were to their deaths, and many of the remaining Jews decided to fight. For years, Ghetto residents in the group Oyneg Shabbos had discreetly chronicled conditions and hid their photos, writings, and short films in improvised time capsules; their activity increased after learning that transports to "resettlement" actually led to the mass killings. In May 1942, Germans began filming a propaganda movie titled "Das Ghetto" which was never completed. Footage is shown in the 2010 documentary called "A Film Unfinished" which concerns the making of "Das Ghetto" and correlates scenes from 'Das Ghetto' with descriptions of the filming of these scenes that Czerniakow mentions in his diary. 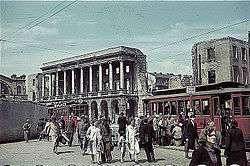 The ghetto was almost entirely leveled during the uprising; however, a number of buildings and streets survived, mostly in the "small ghetto" area, which had been included into the Aryan part of the city in August 1942 and was not involved in the fighting. In 2008 and 2010 Warsaw Ghetto boundary markers were built along the borders of the former Jewish quarter, where from 1940−1943 stood the gates to the ghetto, wooden footbridges over Aryan streets, and the buildings important to the ghetto inmates. The four buildings at 7, 9, 12 and 14 Próżna Street are among the best known original residential buildings that in 1940-41 housed Jewish families in the Warsaw Ghetto. They have largely remained empty since the war. The street is a focus of the annual Warsaw Jewish Festival. In 2011−2013 buildings at number 7 and 9 underwent extensive renovations and have become office space. There is also a small memorial at ul. Mila 18 to commemorate the site of the Jewish underground headquarters during the Ghetto Uprising. In December 2012, a controversial statue of a kneeling and praying Adolf Hitler was installed in a courtyard of the Ghetto. The artwork by Italian artist, Maurizio Cattelan, entitled "HIM", has received mixed reactions worldwide. Many feel that it is unnecessarily offensive, while others, such as Poland's chief rabbi, Michael Schudrich, feel that is thought-provoking, even "educational". Tosia Altman - ghetto resistance fighter, escaped the Ghetto in 1943 uprising through the sewers. Died afterwards after she was caught by the Gestapo when the celluloid factory where she hid caught fire. Mordechaj Anielewicz - ghetto resistance leader in the ŻOB (alias Aniołek). Died with many of his comrades at their surrounded command post. Dawid Moryc Apfelbaum - ghetto resistance leader and commander of the ŻZW. Killed in action during the ghetto uprising. Adam Czerniaków - engineer and senator, head of the Warsaw Judenrat (Jewish council). Committed suicide in 1942. 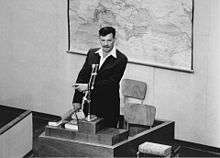 Yitzhak Gitterman - director of the American Jewish Joint Distribution Committee in Poland, resistance fighter. Killed in action during the ghetto uprising. Itzhak Katzenelson - teacher, poet, dramatist and resistance fighter. Executed at Auschwitz-Birkenau in 1944. Janusz Korczak - children's author, pediatrician, child pedagogist and orphanage owner. Executed along with his orphans at Treblinka in August, 1942, after refusing an offer to leave his orphans and escape. Simon Pullman - conductor of the Warsaw Ghetto symphony orchestra. Executed at Treblinka in 1942. Emanuel Ringelblum - historian, politician and social worker, leader of the Ghetto chroniclers. Discovered in Warsaw and executed together with his family in 1944. Kalonymus Kalman Shapira - grand rabbi of Piaseczno. Executed at Trawniki during Aktion Erntefest in 1943. Władysław Szlengel - poet of the Warsaw ghetto; killed in 1943 uprising. Lidia Zamenhof - Esperantist, daughter of Dr. L. L. Zamenhof. Executed at Treblinka in 1942. Nathalie Zand - Neurologist and research scientist. Practised as a doctor within the ghetto. Thought to have been executed at Pawiak prison, September 1942. Mary Berg, diarist, daughter of a mother who was an American citizen. One of a group of Warsaw Ghetto internees exchanged for German POWs in March, 1944. Her story is recounted in The Diary of Mary Berg, first published in 1945 and republished in 2007. Icchak Cukierman – ghetto resistance leader ("Antek"), founder of the Lohamei HaGeta'ot kibbutz in Israel. Died in 1981. Martin Gray – Soviet secret police officer and American and French writer. Simcha Rotem – ghetto resistance fighter ("Kazik"), Berihah activist, post-war Nazi hunter. Władysław Bartoszewski - Polish resistance activist of the Żegota organization in Warsaw. Henryk Iwański - Polish resistance officer in the charge of support for the Ghetto. Died in 1978. Jan Karski - Polish resistance courier who reported on the Ghetto for the Allies. Died in 2000. Zofia Kossak-Szczucka - was a Polish writer and World War II resistance fighter and co-founder of Żegota. Died in 1968. Irena Sendler - Polish resistance member who smuggled 2,500 Jewish children out of the Ghetto and helped to hide them, subject of the film The Courageous Heart of Irena Sendler. Died in 2008. Szmul Zygielbojm - Polish-Jewish socialist politician. In 1943 committed suicide in London in an act of protest against the Allied indifference to the death of the Warsaw Ghetto. ↑ Megargee, Geoffrey P., ed. (2009). The United States Holocaust Memorial Museum encyclopedia of camps and ghettos, 1933–1945. Volume II: Ghettos in German-occupied Eastern Europe. Bloomington: Indiana University Press. pp. 456–460. ISBN 978-0-253-35599-7. ↑ United States Holocaust Memorial Museum, Warsaw Ghetto Uprising Last Updated: May 20, 2008. ↑ Aktion Reinhard. Treblinka Extermination Camp in the Generalgouvernement. Yad Vashem. 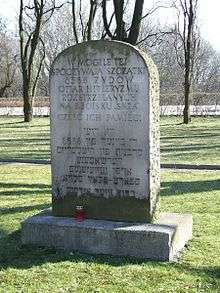 ↑ The statistical data compiled on the basis of "Glossary of 2,077 Jewish towns in Poland" by Virtual Shtetl Museum of the History of the Polish Jews (English), as well as "Getta Żydowskie," by Gedeon, (Polish) and "Ghetto List" by Michael Peters at www.deathcamps.org/occupation/ghettolist.htm (English). Accessed June 21, 2011. 1 2 3 "Warsaw Ghetto Uprising", United States Holocaust Memorial Museum. Last Updated: May 20, 2008. ↑ Berg, Mary (1945). Warsaw Ghetto: A Diary by Mary Berg. New York: L. B. Fischer Publishing Corp. p. 38. ↑ cf Dawidowicz, Lucy S. (1975). The war against the Jews 1933-1945. New York: Holt, Rinehart and Winston. pp. 228–229. ↑ Hilberg, Raul, et al. (editors). The Warsaw diary of Adam Czerniakow: Prelude to Doom (Stein & Day, NY, 1979). 1 2 (English) David Wdowiński (1963). And we are not saved. New York: Philosophical Library pp. 222. ISBN 0-8022-2486-5. Note: Chariton and Lazar were never co-authors of Wdowiński's memoir. Wdowiński is considered the "single author." ↑ Roland, Charles G, "Scenes of Hunger and Starvation" (1992), pages 99-104. ↑ Seidman, Hillel. "Alexander Zusia Friedman", in Wellsprings of Torah: An Anthology of Biblical Commentaries, Vol. 1. Nison L. Alpert, ed. The Judaica Press, Inc., 1974, pp. xii–xxiii. ↑ Farbstein, Esther (2007). Hidden in Thunder: Perspectives on faith, halachah and leadership during the Holocaust. 1. Feldheim Publishers. p. 31. ISBN 9789657265055. ↑ Martin Gilbert, 'The Holocaust' (1986), pages 522-523. ↑ ""Controversy over Adolf Hitler statue in Warsaw ghetto"". The Guardian. 2012-12-28. Retrieved 2016-08-11. ↑ The historians Dariusz Libionka and Laurence Weinbaum maintain that Eisner's memoir, 'The Survivor' (published in 1980) is riddled with inconsistencies and even its author's own fantasies, and as such cannot be regarded as serious survivor testimony and a credible source of information on the uprising. ↑ Laurence Weinbaum, "Shaking the Dust Off" The Story of the Warsaw Ghetto's Forgotten Chronicler, Jewish Political Studies Review Vol. 22 No. 3-4 (Fall 2010). Raul Hilberg, et al. (editors). The Warsaw diary of Adam Czerniakow: Prelude to Doom (Stein & Day, NY, 1979). The ramparts of Warsaw 1943-44 (documentary film) by André Bossuroy, 2014, programme 'Active European Remembrance' of the European Commission.